Nonlive vaccine platforms that induce potent cellular immune responses in mucosal tissue would have broad application for vaccines against infectious diseases and tumors. Induction of cellular immunity could be optimized by targeted activation of multiple innate and costimulatory signaling pathways, such as CD40 or TLRs. In this study, we evaluated immune activation and elicitation of T cell responses in nonhuman primates after immunization with peptide Ags adjuvanted with an agonistic anti-CD40Ab, with or without the TLR3 ligand poly IC:LC. We found that i.v. administration of the anti-CD40Ab induced rapid and transient innate activation characterized by IL-12 production and upregulated costimulatory and lymph node homing molecules on dendritic cells. Using fluorescently labeled Abs for in vivo tracking, we found that the anti-CD40Ab bound to all leukocytes, except T cells, and disseminated to multiple organs. CD4+ and CD8+ T cell responses were significantly enhanced when the anti-CD40Ab was coadministered with poly IC:LC compared with either adjuvant given alone and were almost exclusively compartmentalized to the lung. Notably, Ag-specific T cells in the bronchoalveolar lavage were sustained at ∼5–10%. These data indicate that systemic administration of anti-CD40Ab may be particularly advantageous for vaccines and/or therapies that require T cell immunity in the lung. Most vaccines currently available primarily elicit Ab-based protection. In contrast, vaccines for infections such as HIV-1/AIDS, tuberculosis, malaria, as well as therapeutic cancer vaccines, will likely require potent cellular immune responses, with or without humoral responses. Immune-stimulatory vaccine adjuvants provide a powerful approach to modulate the type of adaptive response a vaccine elicits by using early innate immune activation. Adjuvants can stimulate vaccine responses by targeting APCs through multiple pathways, including engaging TLRs or other activating cell-surface receptors, such as CD40. CD40 is a major regulatory receptor in the TNF-R family widely expressed on APCs, including dendritic cells (DCs), monocytes, and B cells. CD40L (CD154) is expressed on activated T cells, and CD40 ligation on DCs increases costimulatory molecule expression required for stimulation of T cell responses (1, 2). The importance of this pathway is highlighted by the fact that Ag presentation in the absence of CD40 can lead to immune tolerance (3). By contrast, CD40 activation promotes production of IL-12 and the costimulatory function of APCs, which enhances both CD4+/Th1 and CD8+ T cell immunity (4). In mouse models, CD40 stimulation can be delivered to DCs without T cell engagement by administering agonistic anti-CD40Abs, soluble CD40L, or an adenovirus vector expressing CD40L, all of which have been shown to enhance CD8+ T cell responses (1, 5, 6). In addition to targeting CD40, TLR ligands are effective activators of innate immunity and are critical for optimizing T cell responses. In our previous work, we demonstrated that combining CD40 activation with TLR ligands synergistically enhanced cellular immunity in mice, with increased CD4+ and CD8+ T cell responses >10-fold compared with either adjuvant alone (7–9). T cell responses with this vaccine regimen were shown to have antitumor effects in mice, as assessed by tumor reduction (10–12). Poly IC:LC for a combinatorial TLR ligand is particularly promising because it is already tested in clinical cancer immunotherapy and can target multiple innate pathways: TLR3 in DCs and MDA-5 in stromal cells, inducing production of IL-12 and type I IFN, respectively. Mouse models have shown extensive evidence for potential clinical use of CD40Abs in combination with TLR ligands as a versatile vaccine adjuvant to induce robust adaptive immunity. The partially agonistic anti-CD40Ab clone SGN-40 or huS2C6, dacetuzumab, was tested in patients with chronic lymphocytic leukemia and non-Hodgkin’s lymphoma and showed it was well tolerated, although none of the patients achieved an objective response (13, 14). Further, the agonistic anti-CD40Ab, clone CP-870,893, was tested in patients with advanced solid tumors and showed that a single dose can confer antitumor activity (15–17), but improved dosing intervals for optimal immune pharmacodynamics and clinical effect are required. These results highlight the need for an improved understanding of the mechanisms by which this class of Abs mediates their effects in vivo to facilitate the use of anti-CD40Ab as an adjuvant for inducing T cell immunity in humans. Therefore, in this study, we investigated the adjuvanticity of a novel human agonistic anti-CD40Ab (clone 341G2) together with poly IC:LC in nonhuman primates (NHPs). NHPs provide a more predictable model than mice for how immunomodulation can be achieved in humans based on their greater similarity in immune cell subsets, TLR distribution among APCs with humans, and their outbred nature. Moreover, the ability to obtain multiple tissues from NHPs facilitates an extensive characterization of the innate and adaptive immune responses mediated by human anti-CD40Abs, not possible in clinical trials, which are aspects that may be critical for protection against infection or tumors. Approval for this animal study was granted by the Animal Care and Use Committees of the Vaccine Research Center, National Institutes of Health (NIH). Indian rhesus macaques were housed at Bioqual and handled according to the standards of the American Association for the Accreditation of Laboratory Animal Care. Human PBMCs were obtained from individuals participating in the NIH research apheresis program. Signed informed consent was obtained in accordance with the Declaration of Helsinki and approved by the relevant Institutional Review Board. A variety of human anti-CD40Ab clones, including well-known and novel sequences, were screened for their ability to induce DC activation and B cell proliferation in both human and rhesus macaque PBMCs in vitro (Supplemental Fig. 1A–C). The highest cell activation was found by the clone 341G2, which was designed based on the sequence developed by Kyowa Hakko Kirin (Tokyo, Japan) (18). The clone was therefore chosen to investigate potential synergy of CD40 and TLR signaling in vivo. All doses used for immunizations were based on prior dose-response in vivo experiments and previously published ranges (14, 19, 20). For innate activity, rhesus macaques received i.v. administration of 1 mg/kg anti-CD40Ab (clone 341G2 IgG2), 1 mg poly IC:LC (Oncovir, Washington, DC) or the combination of the two. For Ab tracking studies, anti-CD40Ab or isotype control Ab (human IgG2 DNP) was first conjugated to Alexa 680 according to manufacturer’s protocol (Molecular Probes, Carlsbad, CA). The conjugated Ab was then treated with Triton X-114 to remove residual endotoxin and was validated at <0.1 endotoxin units with an Endpoint Chromogenic LAL Assay (Lonza, Basel, Switzerland), as has been performed for prior studies (21, 22). The envelope glycoprotein (Env) peptides (Biomatik, Wilmington, DE) were resuspended to 50 mg/ml in 30% DMSO before immunization. A total of 1.5 mg/kg Ax680-conjugated Ab was mixed with 1 mg poly IC:LC immediately before immunization. The formulation was delivered i.v. and was immediately followed with 1 mg/kg Env peptides delivered i.v. For immunogenicity studies, animals were immunized with 1.5 mg/kg anti-CD40Ab, 1 mg poly IC:LC, and/or 4–8 mg/kg Env peptide pool (as indicated in Supplemental Figs. 2A, 4A), all delivered i.v. as previously described. Control animals received i.m. rAd5 HIV-1 Gag (1 × 1010 PU). Complete blood counts and liver function tests were performed 48 h after the immunization (Idexx, Westbrook, ME) (Supplemental Fig. 1D). Animals were first boosted with 1 mg poly IC:LC and 1 mg/kg Env peptides or rAd5 HIV-1 Gag (1 × 1010 PU) and where indicated received a second boost of 1.5 mg/kg anti-CD40Ab and 1 mg/kg Env peptides. Notably, endogenous Abs against the administered anti-CD40Ab were not detected until after the second immunization with anti-CD40Ab (data not shown). Blood PBMCs were isolated using a density gradient with Ficoll–Paque (GE Healthcare, Fairfield, CT) according to standard procedures. All tissue samples were collected at euthanasia and processed to a single-cell suspension following standard protocol. In brief, lymph nodes (LNs), spleen, and liver samples were manually disrupted and filtered through a 70-μm cell strainer. Liver samples were further purified with Ficoll–Paque. Lung and gut tissues were digested with collagenase treatment for 30 min and mechanically disrupted using the gentleMACS Dissociator (Miltenyi, Auburn, CA). PBMCs and single-cell suspensions were washed and maintained in complete media (R10; RPMI 1640/10% FCS/100 U penicillin/0.1 mg streptomycin; Sigma-Aldrich, St. Louis, MO) or frozen in 90% heat-inactivated FBS and 10% DMSO (Sigma-Aldrich) and stored in liquid nitrogen. Experiments were performed on both fresh and frozen cells. Rhesus serum samples were evaluated for IL-12 p40/p70 and IFN-γ levels using NHP ELISA kits (Invitrogen). All assays were performed according to manufacturer’s protocol. For innate studies and Ab dissemination studies, 6–24 h after immunization, 5 × 106 cells were stained with LIVE/DEAD Fixable Aqua Dead Cell kit according to manufacturer’s protocol (Invitrogen) and blocked with Fc receptor–blocking reagent (Miltenyi). Samples were then surfaced stained with a panel of fluorescently labeled Abs (Supplemental Table I) to determine cell distribution and maturation. For assessment of Ag-specific cytokine production, PBMCs or single-cell suspensions from tissues were restimulated in vitro. A total of 1.5 × 106 cells were cultured in 200 μl R10 per stimulation in a 96-well plate. Samples were stimulated as previously described (23) with 2 μg/ml 9- to 13-mer overlapping HIV-1 Env peptides (matched to immunization) in the presence of 10 μg/ml brefeldin A (Sigma-Aldrich) overnight. Samples were stained the following morning to evaluate IFN-γ, IL-2, and TNF production. Cells were first stained with LIVE/DEAD Fixable AquaBlue viability dye and then surface stained and intracellularly stained (Supplemental Table I). Samples were resuspended in 1% paraformaldehyde before acquisition using a modified LSRII flow cytometer (BD Biosciences). Results were analyzed using FlowJo version 9.7.5, Pestle version 1.7 and Spice version 5.3. Background cytokine staining was subtracted, as defined by staining in samples incubated without peptide. Where indicated, numbers of specific cell subsets are normalized to 1 × 105 viable cells (percent of gated cell subset out of AquaBlue low cells multiplied by 105). Human MDDCs were prepared as previously described (24) and cultured overnight at 1 × 106 cells/ml in R10 with 5 μg/ml anti-CD40Ab clones, 5 μg/ml isotype control Ab (human IgG2 DNP), or 5 μg/ml polyinosinic:polycytidylic acid (Invitrogen). Supernatants were saved for cytokine analysis, and cells were stained for maturation markers CD70 and CD80. We first determined the level of CD40 expression on different leukocyte populations in blood of rhesus macaques. As expected, B cells showed the highest expression of CD40 compared with the other cell populations (Fig. 1A). DC subsets, monocytes, and neutrophils expressed moderate levels of CD40, whereas NK cells and T cells did not have detectable CD40 expression. To highlight the similarity with humans, we assessed CD40 expression in the same cell populations in human PBMCs and showed a similar hierarchy of expression (Fig. 1A). We thereafter determined the early innate activity of an anti-CD40Ab in vivo by evaluating how its administration affected mobilization of circulating cell populations and their activation. Human anti-CD40Ab clones were first screened in vitro for cell activation to select an agonistic clone suitable for in vivo investigation (Supplemental Fig. 1A–C). In addition to anti-CD40Ab, the adjuvant poly IC:LC was also used in these studies based on its potency for inducing T cell immunity. In vivo innate activity of agonistic CD40Ab. (A) Baseline levels of CD40 expression were determined for rhesus macaque and human PBMC subsets by CD40 MFI with florescence minus one levels subtracted (white bars) and percent of CD40+ cells (gray bars), n = 3. Refer to Fig. 2A for cell subset gating. (B and C) Animals were split into three groups (n = 2/group) and immunized i.v. with anti-CD40Ab (1 mg/kg), poly IC:LC (1 mg), or the combination. Circulating PBMCs were monitored for innate activity by flow cytometry. (B) Representative flow-cytometry plots from an animal receiving anti-CD40Ab showing rapid and transient decline of blood leukocytes, including B cells, T cells, and DCs. (C) Time course (0–48 h and day 8) for each cell type as number of cells per 105 viable cells (mean ± SEM, n = 2). (D) Histograms show expression of differentiation makers CD70 and CCR7 on MDCs remaining in the blood at time points 0, 6, 24, and 48 h. Maturation peaks at 6 h after administration. (E) Bar graphs show serum cytokines IL-12p40/p70 and IFN-γ after administration (mean ± SEM, n = 2). Animals received either i.v. anti-CD40Ab alone, anti-CD40Ab in combination with poly IC:LC, or poly IC:LC alone. Blood leukocytes were monitored at 6 h, 24 h, 48 h, and 8 d (192 h) for cell frequencies and phenotypes using multiparameter flow cytometry. After immunization, leukocytes quickly mobilized from the blood in all three groups (Fig. 1B). There was a rapid decline of DCs, B cells, and T cells, but all cells returned to baseline levels by day 8 in all groups (Fig. 1C). Monocytes and neutrophils and in some cases plasmacytoid DCs appeared to first increase at 6 h after administration, before declining and returning to baseline levels (Fig. 1C). Because there was a transient decline of all cell populations regardless of adjuvant group, this is unlikely dependent on Ab interaction with the CD40 receptor on the cells, and may instead be an effect of systemic immune stimulation. The DCs remaining in circulation, particularly at 6 h after administration, exhibited phenotypic differentiation associated with upregulated CD70 and CCR7 expression. CD11c+ myeloid DC (MDC) maturation was most pronounced in the anti-CD40Ab/poly IC:LC group (Fig. 1D). We have previously shown that CD70, a costimulatory receptor on APCs that binds to CD27 on T cells (8, 25–27), was required for enhancement of CD4+ and CD8+ T cell responses in mice after immunization with anti-CD40Ab in combination with TLR agonists (8, 9, 28). In our NHP model, administration of anti-CD40Ab alone also induced high levels of IL-12p40/p70 in the serum at 6–48 h, which returned back to baseline by day 8 (Fig. 1E). There was minimal IL-12 induced by poly IC:LC alone and there was no notable synergy of anti-CD40Ab and poly IC:LC. IFN-γ was also detected in the serum, peaking at 24 h after administration of anti-CD40Ab, suggesting that early IL-12 may augment subsequent IFN-γ responses (Fig. 1E). Finally, consistent with the in vivo observations, both human and NHP DCs produced IL-12 when exposed to anti-CD40Ab in vitro and upregulated CD70 and other costimulatory molecules such as CD80 on DCs (Supplemental Fig. 1A, 1B). In vitro exposure also induced proliferation of B cells (Supplemental Fig. 1C). Altogether, these data demonstrate that anti-CD40Ab alone induces robust innate immune activation in terms of cell mobilization, differentiation, and Th1-type cytokine production. To investigate cell- and organ-specific targeting of the anti-CD40Ab after i.v. administration, we labeled the anti-CD40Ab with the fluorescent dye Alexa 680 to track its dissemination in vivo. To mimic the conditions used in the synergistic adjuvant model reported in mice, the labeled Ab was delivered with poly IC:LC and Ag (synthetic long peptides [SLPs]) (10, 12). Using flow-cytometric analysis, we assessed the median fluorescence intensity (MFI) of Alexa 680 at necropsy 24 h after vaccine administration (Fig. 2A). Labeled anti-CD40Ab was readily detected in multiple organs and on several cell subsets at levels above background, defined by animals that received unlabeled anti-CD40Ab (Fig. 2B). Thus, anti-CD40Ab distributed systemically after i.v. administration and did not target a specific organ. The highest Ab signal above background was detected in the spleen and liver (Fig. 2C), consistent with the typical pharmacodynamics of i.v. delivery and the large number of immune cells, which express CD40, in the spleen. Anti-CD40Ab binding and uptake was evident in B cells, DCs, monocytes, and neutrophils (Fig. 2B, 2C). Although neutrophils have modest expression of CD40 at steady-state, they exhibited the highest binding of anti-CD40Ab, which suggests they may also bind Ab via Fc receptors. In contrast, T cells express neither CD40 nor Fc receptors and did not appreciably bind anti-CD40Ab. We performed similar experiments tracking the dissemination of an Alexa 680–labeled IgG2 isotype control Ab. Several cell subsets and organs showed detectable levels of isotype Ab, although at much lower levels than the anti-CD40Ab. This suggests that CD40-specific interactions are responsible for the majority of anti-CD40Ab binding in vivo (Fig. 2D). In vivo dissemination of anti-CD40Ab after i.v. administration. The anti-CD40Ab or IgG isotype control Ab were conjugated to Alexa 680 and administered i.v. with poly IC:LC and a pool of HIV-1 Env peptides to rhesus macaques to determine Ab dissemination. Blood and tissues were harvested at 24 h and evaluated by flow cytometry for Alexa 680 signal on a variety of cell subsets. (A) Gating scheme used to analyze cell-specific Alexa 680 signal. (B) Representative plots of Alexa 680 signal from different cell populations, as indicated in the key, from one anti-CD40Ab–treated animal compared with PBMCs from an unexposed animal (gray). Bar graphs show (C) anti-CD40Ab Alexa 680 MFI on different cell subsets organized by tissue (mean ± SEM, n = 3) and (D) isotype Ab Alexa 680 MFI on different cell subsets organized by tissue (mean ± SEM, n = 2). As described earlier (Fig. 1A), the level of CD40 expression between cell types in circulation differs substantially, with B cells having the highest CD40 expression. Consistent with this observation, we found that tissue-resident B cells also expressed higher CD40 levels compared with other tissue-matched leukocytes. Despite B cells showing the highest expression of CD40, the Alexa 680–labeled anti-CD40Ab did not preferentially target them. To demonstrate this, we correlated the MFI of CD40 expression, using the 5C3 clone as a staining CD40Ab, with the cell-matched MFI of Alexa 680–labeled anti-CD40Ab (Fig. 3A). In general, the leukocytes displayed the same hierarchy of CD40 expression regardless of the tissue they were derived from, but CD40 expression did not consistently correlate with anti-CD40Ab binding. The Alexa 680–labeled anti-CD40Ab showed the highest signal on neutrophils and monocytes, despite their moderate to low CD40 expression. The same analysis using the labeled isotype control Ab showed a striking reduction in binding to neutrophils and a modest reduction in binding to monocytes and B cells (Fig. 3B). Thus, expression level of CD40 on cells or in tissues did not dictate their level of binding/uptake of the Ab, but it should be noted that cells without CD40 expression, Fc receptors, or endocytic activity, such as T cells, did not show any evidence of anti-CD40Ab binding. Anti-CD40Ab targeting is not dependent on CD40 surface expression but correlates with DC maturation. (A and B) Cell suspensions from tissues of anti-CD40Ab or isotype Ab immunized animals were stained for CD40 surface expression to correlate the level of CD40 expression (CD40 FITC) to the level of delivered Ab signal (bound or internalized, Alexa 680) for each cell subset. Data points are colored based on cell subset for all tissues according to key. Cell subsets were found to group together in the plot regardless of tissue location and are outlined with a tinted box. (C) Representative plots of CD11c+ MDCs from indicated tissues from animals that were immunized with anti-CD40Ab (black line), isotype control (dashed line), or not treated (filled gray) were stained for CD70 expression 24 h after administration. (D) CD11c+ MDCs from different tissues were gated on Alexa 680 CD40+ and CD40− cells, based off of signal from an untreated animal. MDCs exposed to CD40 compared with tissue and animal-matched anti-CD40Ab− MDCs had higher expression of CD70 (normalized to tissue type from untreated animal). Statistical differences tested using paired t test, ****p ≤ 0.0001. In this analysis, we also evaluated phenotypic maturation of DCs in multiple tissues. Again, we focused on upregulation of CD70 because of its importance in T cell activation with anti-CD40Ab. The expression of CD70 on CD11c+ MDCs was compared between animals that had received anti-CD40Ab, the isotype control Ab, or untreated animals (Fig. 3C). A modest upregulation of CD70 was found on MDCs in several tissues from the animals receiving anti-CD40Ab, but a striking increase in CD70 expression was found on MDCs in PBMCs, the liver, and bronchoalveolar lavage (BAL). When evaluating only MDCs that showed associated anti-CD40Ab (Alexa 680+), we found that they had significantly higher CD70 expression than the tissue-matched Alexa 680− MDCs (p > 0.0001; Fig. 3D). Thus, although baseline levels of CD40 expression did not dictate the level of Ab binding, direct interaction with anti-CD40Ab led to maturation and upregulation of CD70. We next assessed the adjuvanticity of anti-CD40Ab in terms of its ability to enhance Ag-specific T cell responses. This adjuvant strategy may be most relevant for therapeutic cancer vaccines but because of the lack of cancer Ags optimized for this model, we immunized animals with a pool of six 9- to 13-mer SLPs derived from HIV-1 Env (29). These peptides are well-characterized and immunogenic in rhesus macaques (29, 30–32), which enabled us to focus on the adjuvant component of the immunization. The peptides should require some degree of processing by APCs for presentation on class I MHC for induction of CD8+ T cell responses but could conceivably be loaded directly into class II MHC for induction of CD4+ T cell immunity. Throughout the study, the magnitude and quality of Ag-specific memory CD8+ and CD4+ T cell responses were assessed using multiparameter flow cytometry and intracellular cytokine staining. Memory T cells were identified by exclusion of CCR7+ CD45RA+ naive cells (33, 34). After first confirming the immunogenicity of the SLPs adjuvanted with anti-CD40Ab/poly IC:LC in a pilot dose study (Supplemental Fig. 2A–E), the individual contribution of each adjuvant component compared with the combination was assessed. For this study, rhesus macaques received the pool of Env peptides given alone or combined with either poly IC:LC, anti-CD40Ab, or both adjuvants (Fig. 4A). Given that our pilot study suggested that the high-dose peptide pool promoted CD8+ responses and the low dose promoted CD4+ responses, animals were primed with an intermediate dose of 4 mg/kg peptides in an effort to balance CD4+ and CD8+ T cell responses. The majority of animals regardless of group showed small but detectable Env-specific CD4+ and CD8+ T cell responses in the blood as early as 1 wk after the prime (Fig. 4B, 4C, blue bars). T cell responses in PBMCs were modest, and there was no significant difference between the groups (Fig. 4B, 4C). In contrast, T cell responses in BAL were robust and groups that received anti-CD40Ab exhibited significantly higher Env-specific T cell responses in BAL after prime compared with the other groups, especially when codelivered with poly IC:LC (p < 0.0001 for all groups; Fig. 4D, 4E). High CD8+ T cell responses were found in the animals receiving anti-CD40Ab with or without poly IC:LC, whereas CD4+ T cell responses were detected only when both adjuvants were combined. 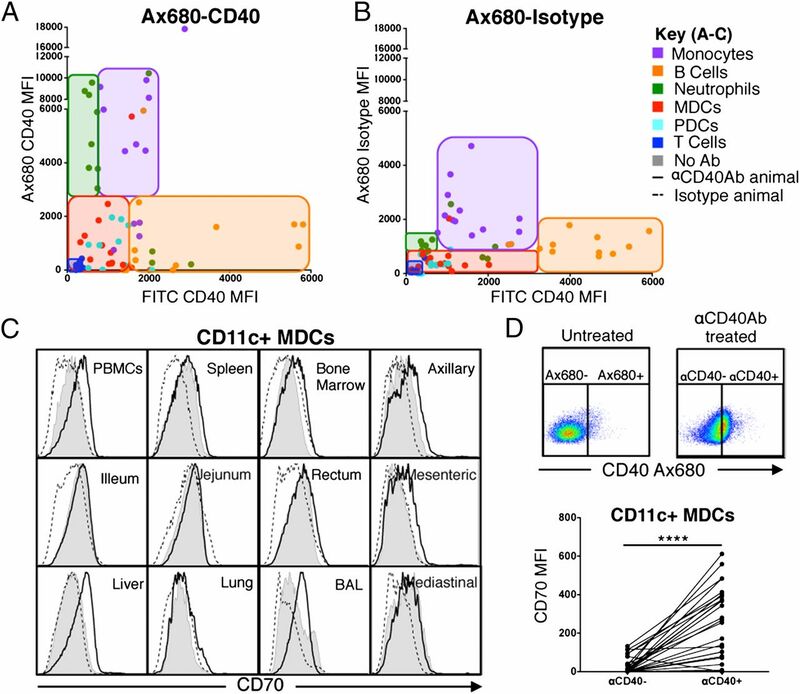 Development of Ag-specific T cells in mucosal tissue is dependent on anti-CD40Ab. Each component of the anti-CD40Ab/poly IC:LC immunization was tested to see individual contributions to the development of Env-specific T cell responses. (A) Experimental design, rhesus macaques were divided into four groups (n = 5/group) and immunized i.v. with one of the four indicated combinations of Env peptide pool (4 mg/kg), poly IC:LC (1 mg), and anti-CD40Ab (1.5 mg/kg). At week 6, animals received a boost of the Env peptide pool (1 mg/kg) with poly IC:LC (1 mg) and at week 15 with the peptide pool (1 mg/kg) and anti-CD40Ab (1.5 mg/kg). Blood and BAL samples were collected as indicated in (A) and used in an intracellular cytokine staining–based assay for T cell responses. 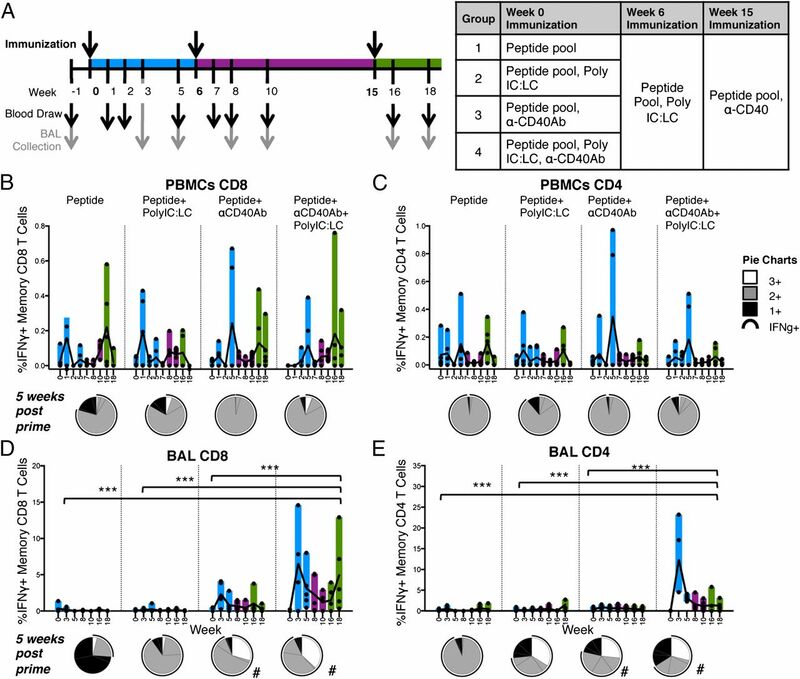 (B–E) PBMC and BAL samples were stimulated overnight with the immunizing peptide pool to recall total memory (Live/CD3+, CD45RA+, and CCR7+ naive cells gated out) Env-specific CD8 T cells (B and D) or CD4 T cells (C and E) as determined by IFN-γ production. Pie charts show the week 5 postprime proportion of total memory CD4/CD8 T cells producing IFN-γ, IL-2, and TNF (white), 2+ cells producing any two of IFN-γ, IL-2, and TNF (gray), and 1+ cells producing IFN-γ, IL-2, or TNF alone (black). The black arc represents cells that produce IFN-γ. Statistical differences between the groups (all time points combined) are indicated in bar graphs, ***p < 0.0001 using two-way ANOVA. Statistical differences for pie graphs are represented as #p ≤ 0.05 compared with peptide alone. In addition to the magnitude of T cell response, high proportions of multifunctional Ag-specific T cells, that is, the ability to produce multiple cytokines at a single-cell level (IFN-γ, IL-2, and TNF), correlates with protection against infection (35). When multifunctionality was assessed in our study, groups that had received anti-CD40Ab had higher proportions of CD8+ T cells that produced more than one cytokine (Fig. 4B–E, pie charts, white or gray portions). Differences in multifunctionality were most pronounced in CD8+ T cells in the BAL, where a high proportion produced all three cytokines (Fig. 4D, pie charts, white portions), but only in groups that received anti-CD40Ab. Taken together, these data illustrate that anti-CD40Ab acts as an adjuvant to enhance both the magnitude and the quality of Ag-specific CD8+ T cell responses. Given the qualitative and quantitative differences in Ag-specific CD8+ T cell responses induced by anti-CD40Ab during priming, we assessed whether such responses would be differentially boosted. All animals were boosted at week 6 with a common boost of poly IC:LC and Env peptides, thereby controlling for the effects of the different formulations on priming only. Surprisingly, we found that this formulation provided a minimal boost of T cell responses (Fig. 4B–E, purple bars), but groups primed with anti-CD40Ab maintained higher proportions of multifunctional T cells after boosting (Supplemental Fig. 3). At 15 wk after priming and 9 wk after the poly IC:LC boost, we administered a second boost using a formulation containing peptides with anti-CD40Ab. Groups that had received anti-CD40Ab during priming exhibited a boosting of CD8+ T cell responses in BAL (Fig. 4B–E, green bars). 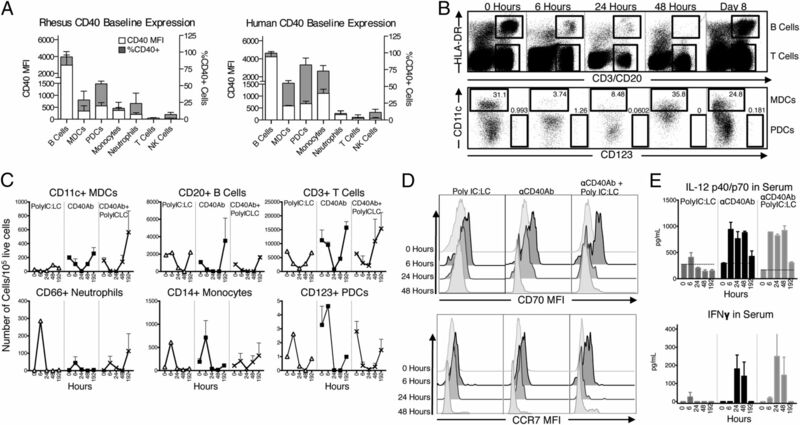 The CD8+ T cell responses were boosted much more efficiently than the CD4+ T cell responses. After the anti-CD40Ab boost, the proportion of multifunctional T cells in the BAL of all groups increased as compared with before the boost, although groups primed with anti-CD40Ab again possessed the highest proportions of such cells (Supplemental Fig. 3). Of note, groups that had not received anti-CD40Ab in the prime but received anti-CD40Ab in the second boost exhibited a noticeable boost of T cell responses in PBMCs, but not in the BAL. This suggests that after Ag-specific T cell responses had been primed, the inclusion of anti-CD40Ab in the boost was not able to reprogram T cells to become BAL-resident. Considering the widespread dissemination of anti-CD40Ab and the high levels of Ag-specific T cells in the BAL, we examined T cell responses in a variety of additional tissues. The two animals with the highest level of Ag-specific T cells in the BAL were euthanized 4 wk after the third boost (anti-CD40Ab and peptides). As a comparison, tissues from two animals primed with peptide alone were also evaluated. Remarkably, high frequencies of Ag-specific T cells were exclusively detected in the lung (Fig. 5A). The responding T cells were primarily CD8+ and were only found in animals primed with anti-CD40Ab, poly IC:LC, and peptides, but not in animals primed with peptide alone. Most of the responding cells in the lung expressed the activation marker CD69 and about half of them were CD103+, indicating that they were tissue-resident T cells (Fig. 5B). 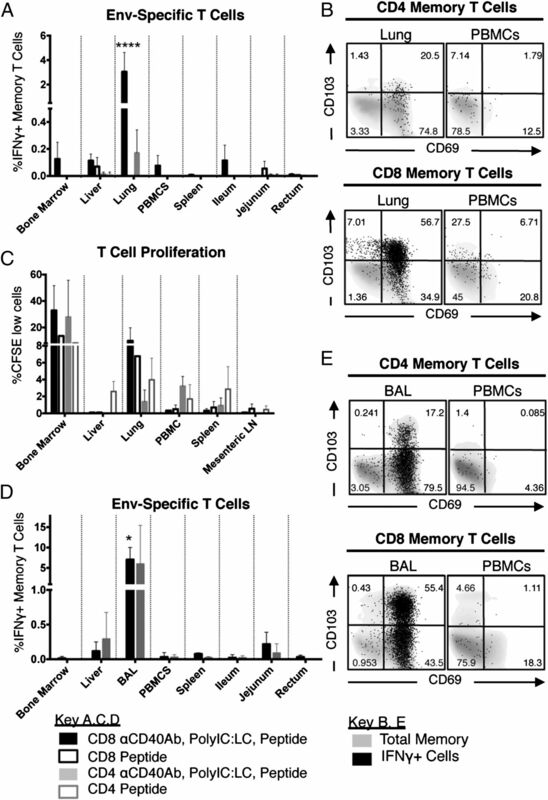 Immunization with anti-CD40Ab elicits tissue-resident T cells compartmentalized to the lung. (A) Tissues from animals primed with anti-CD40Ab, poly IC:LC, and Env peptide pool (filled bars) and animals primed with peptide only (open bars) were evaluated for Env-specific T cells for weeks after the final boost (see Fig. 4) as assessed by IFN-γ production (mean ± SEM, n = 2/group). Tissue sample T cells additionally had NKg2a+ and TCRγδ+ gated out. (B) Env-specific T cells in the lung were predominantly tissue-resident T cells, based on their CD103 and CD69 expression. (C) CFSE-labeled cell suspensions from tissues that were harvested from the same animals were cultured for 5 d with immunizing peptides and Env-specific proliferation was analyzed (mean ± SEM, n = 2/group). (D) Additional animals (see Supplemental Fig. 2) that were primed with anti-CD40Ab, poly IC:LC, and Env peptide pool that had previously demonstrated high levels of T cell responses were boosted with anti-CD40Ab, poly IC:LC, and Env peptide pool. Tissues were evaluated 3 wk later for Env-specific T cell responses as assessed by IFN-γ production (mean ± SEM, n = 3). (E) Env-specific T cell responses that were highest in the lung were predominantly tissue-resident T cells, based on their CD103 and CD69 expression. Statistical differences compared with all other tissues are indicated in bar graphs, *p ≤ 0.05 and ****p ≤ 0.0001 using two-way ANOVA. We also assessed proliferative capacity by restimulating cells from tissues with the Env peptides in vitro for 5 d and were able to detect responding Env-specific CD4+ and CD8+ T cells in all animals, including those primed with peptide alone (Fig. 5C). Proliferating T cells were found in the spleen, PBMCs, lung, and liver, but the most robust proliferation was observed in cells derived from the bone marrow and the lung, especially cells from animals primed with anti-CD40Ab and poly IC:LC. This illustrates the synergistic effect of targeting CD40 and TLR3/MDA-5 simultaneously and suggests that although immunization induced effector CD4+ and CD8+ Env-specific T cells in the BAL, it also established an expandable pool of memory cells in a variety of tissues. Because of the small number of animals examined for the T cell distribution and phenotype, an additional three animals from the dose pilot study were analyzed. These animals were primed with high-dose Env peptides, anti-CD40Ab, and poly IC:LC, then boosted once with poly IC:LC and peptides. The three animals received an additional boost with anti-CD40Ab and peptides 3 wk before euthanasia. Again there was a striking increase in the frequency of IFN-γ–producing Env-specific T cells, but only in BAL (Fig. 5D). We were unable to assess the lung responses in these animals because the lung samples had low viability after in vitro restimulation, potentially reflecting ongoing T cell activation. Responding T cells in the BAL had a similar phenotype to those found in the lung tissue above, expressing high levels of CD103 (Fig. 5E). Altogether, these data demonstrate that detectable Ag-specific memory T cells can be identified from a variety of tissues after expansion, but Ag-specific effector T cells are preferentially resident in the lung and BAL. In this article, the immune mechanisms leading to T cell responses in vivo after administering an agonistic anti-CD40Ab in an NHP model were assessed. We show that anti-CD40Ab rapidly spreads to multiple organs after i.v. administration. This is accompanied by mobilization of circulating leukocytes, induction of high levels of serum IL-12, phenotypic maturation of DCs, and development of robust T cell responses, particularly compartmentalized in the lung when anti-CD40Ab was systemically codelivered with poly IC:LC. An NHP model provides several advantages for performing comprehensive mechanistic and immunological evaluation in multiple tissues compared with mouse models, which can have different tissue-specific distribution of innate signaling pathways. Moreover, using a human Ab provides useful data for translating these findings to human trials. 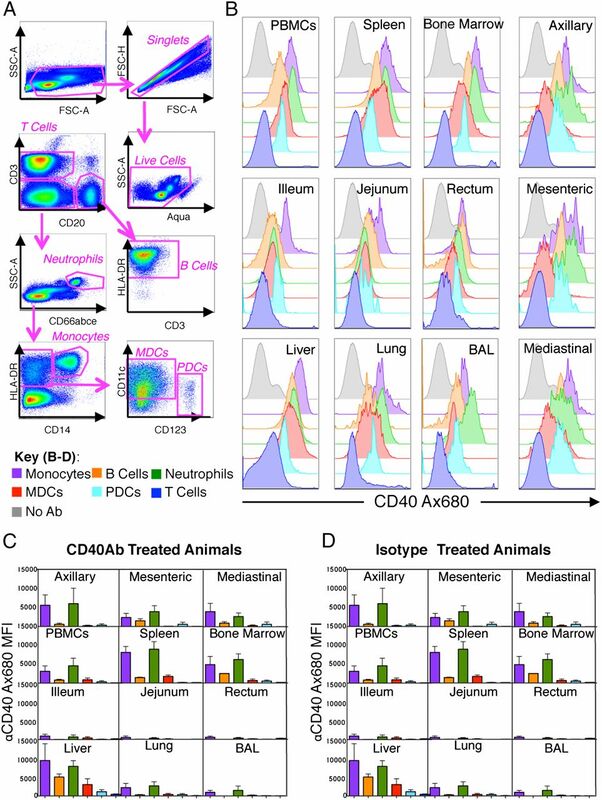 In addition to clear differences between the mouse and human immune systems, recent studies have also evaluated the role of anti-CD40Ab cross-linking and Fc receptor engagement and found that differences in mouse Ab isotypes that mediate differential engagement of activating and inhibitory Fcγ receptors did not translate to human Abs (36, 37). When studying the commonly used murine agonistic anti-CD40Ab, clone FGK45, it was found that specific Fc receptor engagement was necessary for optimal activity. In contrast, the human agonistic Ab clone CP-870,893 did not show the same dependence on Fc receptor engagement (36, 37). CP-870,893 and the anti-CD40Ab used in this study are both of the IgG2 isotype, which typically is less likely to bind Fc receptors or activate complement as compared with the IgG1 isotype. Despite this, the Abs clearly induced a robust innate immune activity, further highlighting that human anti-CD40Abs can act independently of Fc receptors. However, altering the Fc portion of the Ab to improve affinity to activating Fc receptors could still potentially further enhance the function (38). It is therefore important to evaluate human Ab clones in vivo to fully understand the mechanisms behind Ab targeting in vaccination. Despite some promising data on CD40 mAb therapy, there is also evidence of negligible or negative clinical effect (13, 15, 17, 39). However, the clinical trials only evaluate anti-CD40Ab as a single agent, neglecting its potential as an adjuvant. In a phase I clinical trial, patients treated with clone CP-870,893 showed a strikingly similar innate profile to our animals, and the Ab was well tolerated overall (15–17, 40). In both the clinical trial and our study there was a brief cytokine release, activation of circulating cells, and a transient decline returning to baseline at day 8. In this study, the data suggest that leukocytes were mobilized to tissues rather than being depleted. For example, whole blood counts correlated with cell counts from flow cytometry and there were no differences in viability staining after administration (data not shown). In addition, DCs remaining in the blood had upregulated CCR7 expression, which directs them to LNs. Cell mobilization was also not unique to anti-CD40Ab administration, because poly IC:LC alone induced a similar decline and cell types such as T cells, which do not express CD40, were also affected. The redistribution of cells may therefore be a consequence of systemic delivery of immune-stimulatory agents (41–43). The similarities between innate profiles of humans and NHPs treated with agonistic anti-CD40Ab clones demonstrate the clinical relevance of the model. Although the blood offers some insight into the innate activation induced by anti-CD40Ab administration, the ability to track the Ab and examine multiple tissues after administration offered a unique opportunity to further characterize immune responses that was not possible in clinical trials. We found that multiple cell types bound the anti-CD40Ab, but the binding and internalization did not correlate with the level of CD40 expression on the cells. However, it is clear that some level of CD40-specific interaction is necessary for anti-CD40Ab targeting considering the IgG isotype control Ab showed a lower Alexa 680 signal. Interestingly, there may also be a role for indirect CD40 interaction, as demonstrated by the unexpected finding that in vivo binding of isotype Ab was greatly reduced in cell subsets such as neutrophils, which express relatively low levels of CD40. However, neutrophils have the ability to upregulate costimulatory molecules, including CD40, as a result of immune activation (44–46). The isotype Ab was also delivered with poly IC:LC, which leads to systemic immune activation including neutrophil mobilization (Fig. 1C). However, DC differentiation and in particular IL-12 production were much more pronounced with anti-CD40Ab administration as compared with poly IC:LC alone. In tissues we found that CD70 upregulation was directly induced by anti-CD40Ab binding, and the highest levels were seen in BAL and liver, potentially reflecting a better environment for priming. The anti-CD40Ab was therefore superior and unique in directly stimulating DCs and inducing the strong Th1-type stimulatory immune milieu, likely leading to the adjuvant effect found in this study. Even though we did not find any evidence of obvious synergy between anti-CD40Ab and poly IC:LC with regard to innate immune activity, the combination of the two adjuvants clearly led to improved adaptive responses compared with either adjuvant alone. Our immunization strategy induced remarkably high frequencies of sustainable Ag-specific T cells (5–10%) in the BAL, despite modest responses in the periphery. This suggests that there was compartmentalized priming and development of T cell responses in the lung. Prior mouse studies evaluating anti-CD40Ab as a vaccine adjuvant have also shown high levels of Ag-specific T cells in the lung (47). However, most mouse studies only report on the responses in peripheral blood and spleen, which appear to be readily detectable, whereas such responses were modest in our NHP study. It is possible that the responses in mouse are more efficiently disseminated and/or that the doses of model Ags such as OVA, rather than HIV Ags, are not comparable between the animal models. The lung-compartmentalized responses could be a result of the i.v. route of delivery and/or are due to inherent characteristics of the anti-CD40Ab. We found that systemic administration of the anti-CD40Ab efficiently targeted lung DCs, which could lead to preferential generation of lung resident T cells. Lung resident DCs in mice were shown to imprint T cell homing to the lung through induction of CCR4 expression on the T cells (48). Although we were not able to evaluate CCR4 expression on T cells in rhesus tissues, the responding T cells appeared to be largely CD103+, indicating that they were tissue-resident memory cells (49). We also found that APCs sorted from the lung enhanced T cell proliferation and induced CD103 expression when pretreated with the anti-CD40Ab in vitro (data not shown). As mentioned earlier, the high DC maturation detected in the lung may indicate a superior environment for DC presentation and priming of T cell responses after anti-CD40Ab administration. Mouse data also show that although T cells imprinted by lung DCs preferentially home to the lung, they are more flexible in their peripheral distribution than T cells imprinted by skin or gut DCs (48). This may explain our observations that Ag-specific effector T cells were preferentially in the lung but could also be found systemically after expansion for 5 d in a proliferation assay. These results indicate that the immunization targeted and activated lung DCs because of the route of delivery, but they do not rule out the possibility of intrinsic signaling of the anti-CD40Ab to imprint lung homing T cells. In a pilot study when we administered Ag and poly IC:LC s.c. and anti-CD40Ab i.v., the T cell responses were still modest in peripheral blood and higher in BAL, suggesting that priming restricted to the skin draining LNs in the presence of systemic CD40Ab still induces some degree of compartmentalized lung responses (Supplemental Fig. 2F–I). Future studies are needed to elucidate whether anti-CD40Ab would be particularly potent for vaccine formulations to pathogens and tumors specific to the lung and warrants investigation of other therapeutic Abs, for example, anti-PD1 and anti-CD20 also delivered i.v. It will also be important to test the functionality of these T cells with tumor Ags and investigate the potential of targeting other organs with this Ab with alternative routes of delivery. Although it is clear that successful next-generation vaccines to both infectious diseases and cancer will require potent and durable T cell responses, a much better understanding of how strong vaccine responses can be elicited and maintained is essential. These studies demonstrate the ability of an agonistic anti-CD40Ab to induce high levels of DC targeting and activation, presumably leading to substantial lung-specific CD8+ T cell responses. Altogether, such data contribute to the understanding of how T cell responses can be tailored via innate immune stimulation to be more efficacious and to improving the design of future vaccine formulations. R.M.K. is a founder of ImmuRx, Inc. whose intellectual property is based on the combined TLR agonist/anti-CD40Ab immunization platform. The other authors have no financial conflicts of interest. We thank John-Paul Todd, Vaccine Research Center, NIH; the animal care personnel at Bioqual; Oncovir, Inc. for providing poly IC:LC; and Linnea Haeggblom for technical assistance. This work was supported by the Vetenskapsrådet (Grant 521-2012-3377 to K.L. ), the Swedish Governmental Agency for Innovation Systems (Vinnova) (Grant 2010-00999 to K.L. ), intramural funds as U.S. National Institutes of Health investigators (to R.A.K. and R.A.S. ), and Small Business Innovation Research Phase 2 Grant 5R44AI080030 to ImmuRx, Inc.
. 2008. Immunogene therapy by adenovirus vector expressing CD40 ligand for metastatic liver cancer in rats. Anticancer Res. 28(5A): 2785–2789.
. 2000. CD40-CD40 ligand. J. Leukoc. Biol. 67: 2–17.
. 1995. In the absence of a CD40 signal, B cells are tolerogenic. Immunity 2: 645–653.
. 2000. The role of CD40 in peripheral T cell tolerance and immunity. J. Mol. Med. 78: 363–371.
. 2006. Blood dendritic cells generated with Flt3 ligand and CD40 ligand prime CD8+ T cells efficiently in cancer patients. J. Immunother. 29: 499–511.
. 2011. The CD40 agonist antibody CP-870,893 enhances dendritic cell and B-cell activity and promotes anti-tumor efficacy in SCID-hu mice. Cancer Immunol. Immunother. 60: 1009–1017.
. 2004. Combined TLR and CD40 triggering induces potent CD8+ T cell expansion with variable dependence on type I IFN. J. Exp. Med. 199: 775–784.
. 2010. Multiple innate signaling pathways cooperate with CD40 to induce potent, CD70-dependent cellular immunity. Vaccine 28: 1468–1476.
. 2007. Combined TLR/CD40 stimulation mediates potent cellular immunity by regulating dendritic cell expression of CD70 in vivo. J. Immunol. 178: 1564–1572.
. 2012. TriVax-HPV: an improved peptide-based therapeutic vaccination strategy against human papillomavirus-induced cancers. Cancer Immunol. Immunother. 61: 1307–1317.
. 2013. Persistent antigen at vaccination sites induces tumor-specific CD8⁺ T cell sequestration, dysfunction and deletion. Nat. Med. 19: 465–472.
. 2008. In vivo expansion, persistence, and function of peptide vaccine-induced CD8 T cells occur independently of CD4 T cells. Cancer Res. 68: 9892–9899.
. 2009. Phase I study of the humanized anti-CD40 monoclonal antibody dacetuzumab in refractory or recurrent non-Hodgkin’s lymphoma. J. Clin. Oncol. 27: 4371–4377.
. 2010. A phase I study of dacetuzumab (SGN-40, a humanized anti-CD40 monoclonal antibody) in patients with chronic lymphocytic leukemia. Leuk. Lymphoma 51: 228–235. Beatty, G. L., D. A. Torigian, E. G. Chiorean, B. Saboury, A. Brothers, A. Alavi, A. B. Troxel, W. Sun, U. R. Teitelbaum, R. H. Vonderheide, and P. J. O’Dwyer. 2013. A phase I study of an agonist CD40 monoclonal antibody (CP-870,893) in combination with gemcitabine in patients with advanced pancreatic ductal adenocarcinoma. Clin Cancer Res. 19: 6286–6295.
. 2013. Phase I study of the CD40 agonist antibody CP-870,893 combined with carboplatin and paclitaxel in patients with advanced solid tumors. OncoImmunology 2: e23033.
. 2007. Clinical activity and immune modulation in cancer patients treated with CP-870,893, a novel CD40 agonist monoclonal antibody. J. Clin. Oncol. 25: 876–883. , inventors; Kyowa Hakka Kirin Co., Ltd., assignee. Anti-cd40 antibody mutants. United States patent application 14/017,789, Publication No. US 2014/0105907 A1. 2014 Apr 17.
. 2012. Phase I study of the anti-CD40 humanized monoclonal antibody lucatumumab (HCD122) in relapsed chronic lymphocytic leukemia. Leuk. Lymphoma 53: 2136–2142.
. 2013. Polyinosinic-polycytidylic acid is the most effective TLR adjuvant for SIV Gag protein-induced T cell responses in nonhuman primates. J. Immunol. 190: 4103–4115.
. 2005. HIV Gag protein conjugated to a Toll-like receptor 7/8 agonist improves the magnitude and quality of Th1 and CD8+ T cell responses in nonhuman primates. Proc. Natl. Acad. Sci. USA 102: 15190–15194.
. 2006. Toll-like receptor agonists influence the magnitude and quality of memory T cell responses after prime-boost immunization in nonhuman primates. J. Exp. Med. 203: 1249–1258.
. 2013. Comparative analysis of the magnitude, quality, phenotype, and protective capacity of simian immunodeficiency virus gag-specific CD8+ T cells following human-, simian-, and chimpanzee-derived recombinant adenoviral vector immunization. J. Immunol. 190: 2720–2735.
. 1998. Immunocytochemical detection of cytokines and chemokines in Langerhans cells and in vitro derived dendritic cells. J. Immunol. Methods 214: 97–111.
. 2005. Induction of CD70 on dendritic cells through CD40 or TLR stimulation contributes to the development of CD8+ T cell responses in the absence of CD4+ T cells. J. Immunol. 174: 710–717.
. 2008. Expression of costimulatory ligand CD70 on steady-state dendritic cells breaks CD8+ T cell tolerance and permits effective immunity. Immunity 29: 934–946.
. 2012. CD27 stimulation promotes the frequency of IL-7 receptor-expressing memory precursors and prevents IL-12-mediated loss of CD8(+) T cell memory in the absence of CD4(+) T cell help. J. Immunol. 188: 3829–3838.
. 2012. Type I IFN-dependent T cell activation is mediated by IFN-dependent dendritic cell OX40 ligand expression and is independent of T cell IFNR expression. J. Immunol. 188: 585–593.
. 2008. Selective induction of cell-mediated immunity and protection of rhesus macaques from chronic SHIV(KU2) infection by prophylactic vaccination with a conserved HIV-1 envelope peptide-cocktail. Virology 370: 130–141.
. 2005. Protection by dendritic cells-based HIV synthetic peptide cocktail vaccine: preclinical studies in the SHIV-rhesus model. Vaccine 23: 2154–2159.
. 2013. DNA/long peptide vaccination against conserved regions of SIV induces partial protection against SIVmac251 challenge. AIDS 27: 2841–2851.
. 2010. Long peptides induce polyfunctional T cells against conserved regions of HIV-1 with superior breadth to single-gene vaccines in macaques. Eur. J. Immunol. 40: 1973–1984. Darrah, P. A., D. T. Patel, P. M. De Luca, R. W. B. Lindsay, D. F. Davey, B. J. Flynn, S. T. Hoff, P. Andersen, S. G. Reed, S. L. Morris, et al. 2007. Multifunctional TH1 cells define a correlate of vaccine-mediated protection against Leishmania major. Nat. Med. 13: 843–850. Betts, M. R., M. C. Nason, S. M. West, S. C. De Rosa, S. A. Migueles, J. Abraham, M. M. Lederman, J. M. Benito, P. A. Goepfert, M. Connors, et al. 2006. HIV nonprogressors preferentially maintain highly functional HIV-specific CD8+ T cells. Blood. 107: 4781–4789. Richman, L. P., and R. H. Vonderheide. 2014. Role of crosslinking for agonistic CD40 monoclonal antibodies as immune therapy of cancer. Cancer Immunol. Res. 2: 19–26. Vonderheide, R. H., and M. J. Glennie. 2013. Agonistic CD40 antibodies and cancer therapy. Clin. Cancer Res. 19: 1035–1043.
. 2010. Immune modulation with weekly dosing of an agonist CD40 antibody in a phase I study of patients with advanced solid tumors. Cancer Biol. Ther. 10: 983–993.
. 2009. Activation of human B cells by the agonist CD40 antibody CP-870,893 and augmentation with simultaneous toll-like receptor 9 stimulation. J. Transl. Med. 7: 93.
. 2002. Response of in vivo protein synthesis in T lymphocytes and leucocytes to an endotoxin challenge in healthy volunteers. Clin. Exp. Immunol. 130: 263–270.
. 2006. Type I interferons directly regulate lymphocyte recirculation and cause transient blood lymphopenia. Blood 108: 3253–3261.
. 2005. Systemic administration of a TLR7 ligand leads to transient immune incompetence due to peripheral-blood leukocyte depletion. Blood 106: 2424–2432.
. 1997. Activation of human T cells by major histocompatability complex class II expressing neutrophils: proliferation in the presence of superantigen, but not tetanus toxoid. Blood 89: 4128–4135.
. 1996. In vivo induction of HLA-DR on human neutrophils in patients treated with interferon-gamma. Blood 87: 3068.
. 2012. Vaccine-elicited CD8+ T cells protect against respiratory syncytial virus strain A2-line19F-induced pathogenesis in BALB/c mice. J. Virol. 86: 13016–13024.
. 2013. Lung dendritic cells imprint T cell lung homing and promote lung immunity through the chemokine receptor CCR4. J. Exp. Med. 210: 1855–1869.
. 2014. Human memory T cells: generation, compartmentalization and homeostasis. Nat. Rev. Immunol. 14: 24–35.